Hello my crafty friends! Happy New Year’s Eve to you all! 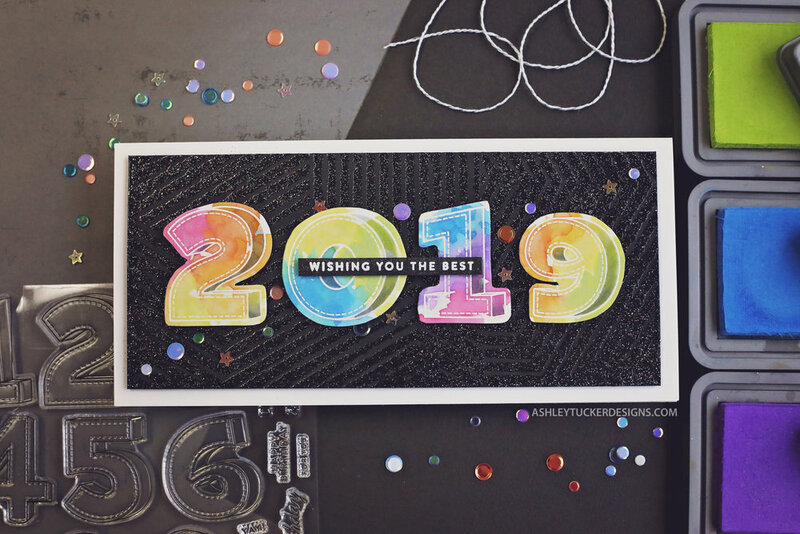 Today I have a fun card to share with you celebrating the new year! First I stamped the numbers from the Birthday Numbers stamp set with my MISTI tool onto Canson watercolor paper with embossing ink. I embossed them with Alabaster white embossing powder. I painted over the numbers using Distress Oxide ink. I smooshed the ink pads onto my Tim Holtz glass mat and picked up the color with a watercolor brush to paint with. I used the colors Picked Raspberry, Spiced Marmalade, Squeezed Lemonade, Twisted Citron, Salty Ocean, and Wilted Violet. Once it was dry I fussy cut the numbers out. For the background I used the Mod Stripes stencil on a piece of Bazzill Licorice Twist. I smooshed embossing ink over the stencil and then embossed the design with Rainbow Sparkle embossing powder. I popped up the black background onto a card base with foam tape and then I popped up the numbers on that. I added some shading the to numbers with some gray Copic markers to help them pop a little more. I created a sentiment strip by embossing a stamp from the Deco Borders & Corners stamp set onto black cardstock with Alabaster embossing powder. 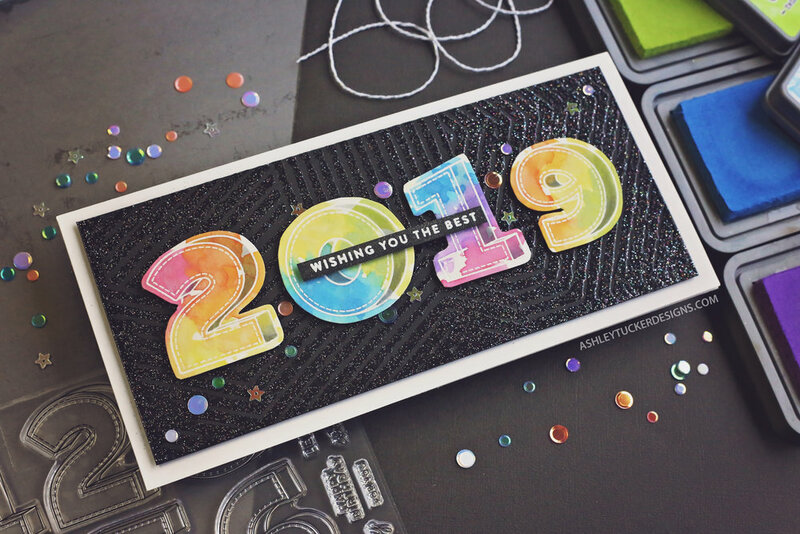 I popped up that strip on top of the numbers so that the card says “Wishing You the Best 2019.” To finish the card I went over the sentiment with Wink of Stella and added some fun sequins.